The modern era haughtily displays a lifestyle where the technology has made traveling, working and interacting an extremely easy task for man. Various gadgets and technological advancement have made life far more comfortable as compared to the previous times. Even all these comforts have failed to provide man; a Stress free life. Life has become hectic, complex and burdensome. Since, more is the advancement in the technology, more is demanded of man, more is expected of him. Sparing out time for one's own family has become a rarity. This leads to Stress, aggressiveness and gives way to other diseases . Besides this, there are other factors contributing to a diseased body,i.e. bad lifestyle, changing environment- polluted air water and food., etc. In this rut of life, each one is left to cater to one's own needs, causing more and more stress and distress, menacing one's very existence, disturbing peace and harmony in one's life. To set this imbalance right, our ancestors formulated a plan, a system of medicine. It was devised thousand of years ago, yet , is as useful to the mankind today as it was then. In this blog I will not explain the definition of Ayurveda or Herbs, for that you may refer the Glossary. In this write up , you will be informed about other aspects of Ayurveda, its precise significance to the mankind. Ayurveda is not a mere medicine system. It is not limited to medicine, but is very vast. Ayurveda is a healthy lifestyle... It teaches the practical details of balancing body, mind and emotions. It teaches the lifestyle which includes holistic system, ranging from diet, to rest periods, to work and to live, the way you are supposed to. It includes exercise, dietary changes, meditation, yoga, baths,acupuncture treatment and herbal tonics. Ayurveda is the part of heritage of ancient India. It aims at curing an existing disease and fixing the imbalance, if any, and aims to prevent it from getting converted into a disease. So, why are you still skeptic about this medicine system ? 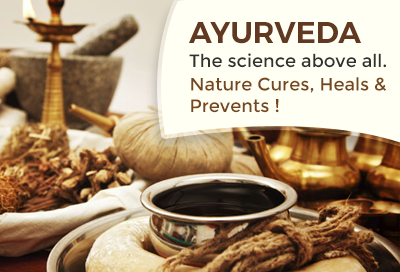 Ayurveda has also been recognized by WHO as an effective health care system. Even in prevalent medicine system, medications commonly used by us today come from plants. At least one of the basic ingredients of plant material forms part of several prescription drugs available in the world. Prevalent medicine system is sort of dependent on Ayurveda for its scientific research and clinical trials. Probably, Ayurveda is the only science where deadly diseases like blood cancer or leukemia is cured, without side effects.. For ex: Marijuana is a Herb which is widely being used to cure Cancer. Nations are spending billions on the research for a cure. Scientists are researching ; how ayurvedic treatments acts selectively for Cancer treatment, inducing cell death of malignant cells only and not affecting the neighboring healthy cells, unlike Chemotherapy. The herbal cure is getting worldwide acceptance and thus emphasizing modern scientific evaluation and extraction of medicines from plants. Ayurveda is the science of healthy and disease free life. It is the knowledge which is infinitely vast , it is abundantly supplied with guidelines which, if followed rigorously and regularly, would avoid all the fuss of visiting doctors and would spare the agony of diseases. The health pattern carved out by Ayurveda is based on Nature and only Nature. It is not disease specific, but, acts as both curative and preventive medicine system. It helps in rejuvenation of the entire immune system of the body; we have Rasayanas for it. The entire body system is enhanced with abundant energy and harmony. Ayurvedic Science helps in treating certain chronic conditions, and is also known to cure auto immune disorders. Ayurveda deals not merely with medical science, but also with the social, ethical, intellectual & spiritual life of man. The Ayurvedic medicine system is known to provide side effect- free treatment. Since, Rasayanas are the Herbs which do not cause any side effects, so they can be used for the lifetime. Ayurveda is thus, the ultimate answer to all the hassle, the man is going through now, physical, mental, emotional or spiritual. or may face in near future. Nature has bestowed us with abundant and precious treasure, Herbs. I live in United States, help me thank DR. covenant who helped cured me from HERPES SIMPLEX in just one (1) week. I got to know him from a friend who he helped, at first I doubt if his herbal product would work until my friend put her car at stake that if it doesn't work she would give me her car. After which I decided to try, to God be the glory am now a living testimony, all thanks to DR. covenant, if not for him I would not have been healed so easily.. You can reach him via covenantsolutiontemple@gmail.com or call/whatsapp at +2349057353987, you can also contact him on cure on...... 1. GONORRHEA 2. SYPHILIS 3. ASTHMA 4. STROKE 5. DIABETES MELLIFLUOUS 6. SIMPLEX HERPES 7. RINGING EAR 8.LOW SPERM COUNT 9.SICKLE CELL 10.HIV/AIDS 11.CANCER 12.LYME DISEASE .. I want to find out if you have the herbs combination for Rasayana? The blood pressure in my mum is high, I am looking for herbs and that can cure this condition that might be affecting her kidney.. Thanks I am a follower of your website and I like what you are doing. Thanks for your help. Ayurveda have great history in india. I like the ayurvedic product most. Nice blog. Hi sir, i am frequent reader of your website. First i must say, you have done a tremendous work in bulding this website. Info on herb, diseases, organs under one roof is a marvelous effort. Only one issue that i felt, Since i am a blogger myself. I felt your blogs are not getting updated frequently. I have read them all. They are good but old.